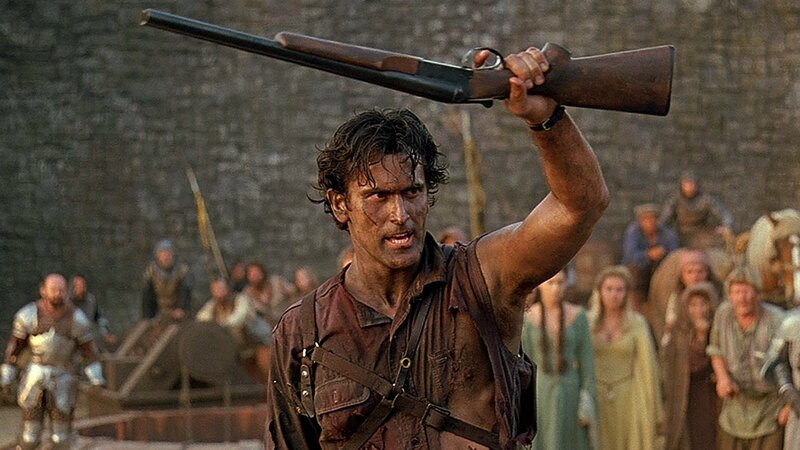 Of all the movies that we have looked at so far on Medievalists.net, Army of Darkness is the funniest (if you have a sense of humour like mine) and perhaps has the least chance of actually being shown in a history class. The film is the third in the Evil Dead trilogy, which propelled Sam Raimi into being one of the top directors in Hollywood (the story of how the first Evil Dead film was made is very interesting on its own). The first two were horror films based around a group of young people uncovering the Necronomicon (a book of evil), which leads to most of the group being killed in gruesome ways. Bruce Campbell plays Ash, who at the end of Evil Dead 2, is able to use the Necronomicon to send the evil entity back in time. Unfortunately, Ash is also sucked back in time and ends up in medieval England. Army of Darkness begins with poor Ash as a prisoner in chains about to be fed to an evil witch/zombie/monster. Unlike the last two films, which were meant to be scary, this sequel is an action-comedy, heavy on the comedy. Ash is soon able to kill the witch and become the ‘king’ of the castle. However, he wants to go back to his own time, so goes on a quest to retrieve the Necronomicon. He finds the book, but accidentally manages to awaken the Deadites, and Ash has to lead the medieval soldiers against the Army of Darkness. The movie is considered a kind of ‘cult-classic’ mostly due to the performance by Bruce Campbell. He is a great anti-hero: mistake prone and hilarious with his one-liners, ‘Ash’ is someone you root for and also want to see beaten-up. Many a fan will know word for word his entire dialogue in the film, and I certainly cannot hear the word ‘Groovy” without thinking of him. If you are not interested in seeing the film, perhaps try our the musical that has been based on it.